The Karen National Union (KNU), the Democratic Karen Benevolent Army (DKBA) and the Karen National Union/Karen National Liberation Army Peace Council (KNU/KNLA-PC) will participate in the national-level political dialogue as a single block. The decision was reached at a meeting between the three Karen ethnic armed organisations (EAOs) in Lay Kaw Myothit in Myawaddy Township, Karen State on 21 November. The Karen Youth Organisation (KYO), and other Karen social organisations also attended the meeting. 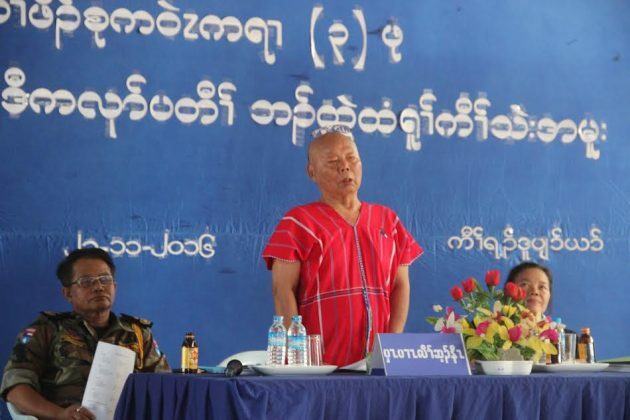 Leading the EAO representatives were General Mutu Say Poe, the KNU chairman; Dr Naw Ka Paw Htoo, the KNU/KNLA-PC Secretary; and Major-General Saw Muu Kho (a.k.a. Phoo Naw Way), the DKBA Chief of Staff. They discussed issues surrounding the nationwide ceasefire agreement’s (NCA) national-level political dialogue. These included the programme for the dialogue, the venue, working programmes and the responsibilities of organisations involved in the dialogue. The DKBA and the KNU/KNLA-PC separated from the KNU in 1994 and 2007 respectively. Though the three groups signed the NCA separately in 2015, they have since agreed to follow the KNU’s political leadership. The national-level political dialogue is one of the working programmes that were set up as part of the NCA. Proposals and suggestions that arise from the political dialogue will be submitted to the Union Peace Conference through the relevant committees. According to the KNU political dialogue meetings covering politics, social issues, economics, security, land and the environment will be held in Rangoon and Hpa-an, with the final Karen national-level political dialogue meeting to be held in Lay Wah (Law Khee Lar). The Karen political parties and social organisations will hold another meeting to discuss the national-level political dialogue in Hpa-an during the first week of December.